Below are samples of the documents you may be required to fill out for financing. Contact us for more information or to get the required forms. Download a sample finance form. Download a sample training agreement. Let's face it – learning to fly and continuing to fly isn't a cheap hobby. But the thrill and other benefits are well worth the expense, so don't let the cost delay or deter your dream! 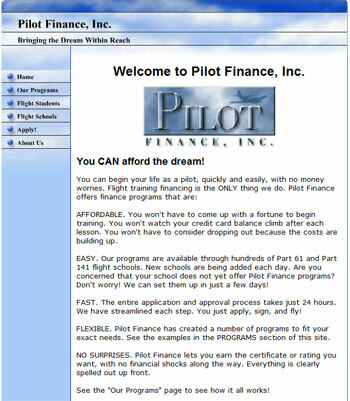 For help with financing, at About Time Aviation we recommend using Pilot Finance Incorporated. They make the process fast (24 hours! ), easy and affordable. As it says on their home page "You CAN afford the dream!"